2009. Bantam. Hardcover. 312 pages. 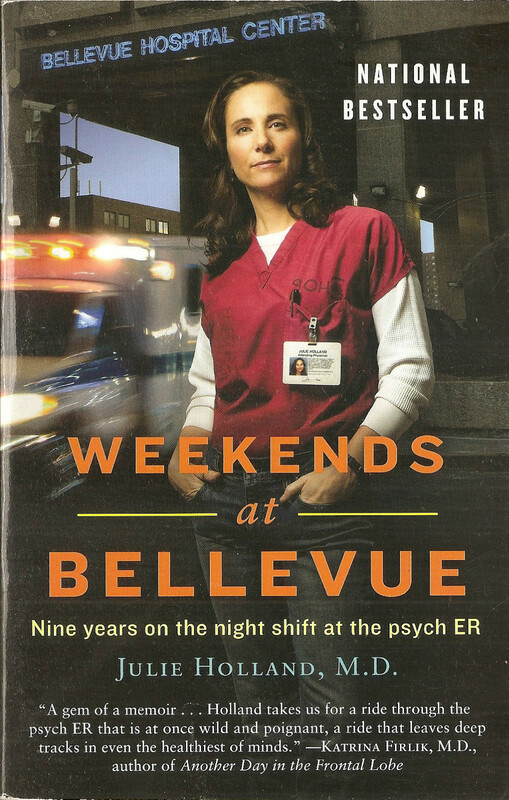 For nine years, Julie Holland worked the weekend shift as a physician at Bellevue Hospital’s Comprehensive Psychiatric Emergency Program – in other words, the psychiatric ER. Patients are sometimes prisoners, sometimes people recently arrested, sometimes injured people referred to the psych doctors from other hospital departments. There are also patients who walk in for help, or maybe to fake their way into getting a bed for the night. Dr. Holland’s job was mainly to perform a sort of mental health triage, trying to determine if a person should be admitted or discharged, or trying to determine if a person is fit to stand trial. Weekends at Bellevue chronicles Holland’s experiences at Bellevue, with particular focus on her own behavior and attitude. Holland sports a brash attitude that at times compromises her professionalism, and she works with a therapist to get to the root of her own issues. A large part of the book details Holland’s friendship with one of her mentors, Lucy, who also works at Bellevue until breast cancer claims her life. Holland also has a combative relationship with another doctor, Daniel, who is close to Lucy as well, which adds complications. I think I was expecting something else from Weekends at Bellevue, maybe a marshaling of anecdotes to paint a broader picture of mental illness in our time. And there are definitely plenty of anecdotes, but the overarching theme of the book is Dr. Holland’s personal journey as a person and a doctor. There is nothing wrong with that focus, but when you have a psych doctor chronicling her own state of mind, the anecdotes tend to come with a thick layer of self-analysis. This meant that many anecdotes about patients seemed to be less about the patient and more about how the patient affected Holland. Thus there was a flavor of self-absorption to the book, which is, granted, always a risk in the memoir genre. I will give Holland plenty of credit though for being brutally honest about herself. She doesn’t gloss over her mistakes and failures. With patients and even colleagues, she can be too aggressive, too detached and too cavalier. Holland feels compelled to show others that she is tough and can take anything that is thrown at her, but finds there is a cost. The following is an excerpt from the book, shortly after Dr. Holland has heard from one of the residents, Desmond, that one of the neurology patients jumped out a hospital window and died. “Like a cartoon?” I ask. Desmond looks at me witheringly, pityingly, and walks away. Desmond is the poster child for Karuna, the Buddhist concept of infinite compassion. We both want others’ suffering to cease, and yet we go about it in completely different ways. Should I be more like Desmond, with his limitless undying love? My patients would be better off if I could stay opened up and available, giving and understanding, yet my remoteness resurfaces routinely in my work at the hospital. It is my protection, like a hazmat suit, and it’s been effective, so it’s hard for me to move beyond it, even though I’m trying. The stories about patients were probably the best aspect of the book. Also, I liked the chapter where Holland discusses the issues she faces in her private practice as a psychopharmacologist. It takes some getting used to, the idea that a little pill, swallowed daily, can provide such substantial belief. Some people adjust to this new fact of life, and others fight it. I encourage my patients to stay on their medications for at least six months, to get comfortable with being comfortable. Many people feel better than they’ve ever felt, and that feels awkward. Whether it’s okay to stay medicated or not is a thorny issue. I wouldn’t have minded reading more about Dr. Holland’s perspective on psychiatric medications, informed as she is by observations of her own patients. Quite a bit of the middle chapters are devoted to the fraught interpersonal relations between Dr. Holland and her ailing mentor, Lucy, and her colleague/rival Daniel. No disrespect meant toward the people involved, but this was the least engaging part of the book for me. I never felt that I had a good handle on Lucy as a person. Holland told the reader how much Lucy meant to her, but I never really ‘felt’ this closeness or the eventual loss. After Doomsday Book sucked me in and broke my heart, I was having a hard time getting into a new book. I had a non-fiction book I was slowly working through, but I needed a fictional story to settle me down. 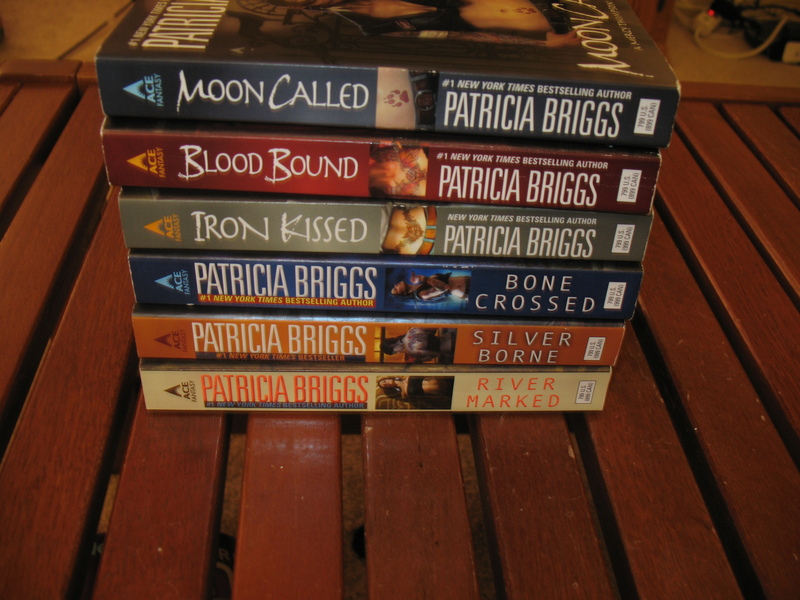 So I turned to re-reading a favorite series, the Mercy Thompson books by Patricia Briggs. There are currently six books in total and the above photo shows them in chronological order, with the first book on top. This urban fantasy series features a Volkswagon mechanic named Mercy Thompson, who also happens to be a coyote shapeshifter. Raised by werewolves in Montana, she now calls the Tri-Cities area of Eastern Washington state her home. The area is heavily populated by various supernatural groups. Besides werewolves (and Mercy), there are vampires, fey and ghosts. Humans live there too of course. Some are Mercy’s friends, some are her enemies, and some are unpredictable. I read the first book, Moon Called, in early summer 2008. It is a true fact that Moon Called was in the same library haul as Twilight, coincidentally another urban fantasy book featuring vampires and werewolves in the state of Washington. I started Twilight first, but when my interest lagged a third of the way through, I picked up Moon Called. I happily zipped right through Moon Called and didn’t look back. This summer was the first time re-reading the series and let me tell you that a Mercy Thompson marathon is the way to do it. Over a period of several weeks, I read all six books in a row. This experience melded the individual books together, and I become much more attuned to the story arcs and character development spanning the entire series. For instance, in the first book, Mercy has friends but not really much in the way of family. Though she grew up with werewolves, she definitely didn’t feel like she was one of them. Her foster werewolf parents died when she was a teenager. She’s on good terms with her birth mother and her step-sisters and step-father, but they aren’t a regular part of her life. As the series progresses, we see her acquire a family in the form of the local wolf pack. It’s not an easy transition for her or for them, but in the later books, there is a definite sense that she belongs with them. One of the things I love about the Mercy Thompson series is that Briggs creates platonic relationships that are just as interesting and important as the romantic relationships. Raise your hand if you’ve read several books where the romantic relationship trumps all, and all other relationships are perfunctory and filler. Not so here. The secondary characters of Briggs’ books are awesome, have their own concerns and stories, and Mercy’s relationships with them are not static, but also develop and change over time. At this point, I’m particularly interested in where the story is going for Ben, the British werewolf packmember with a troubled past; Stefan, a vampire who is incredibly loyal but also possesses flexible morality; and Jessie, Adam’s unsupernatural teenage daughter who has started taking on larger roles in the story. Reading the series in a row helped me understand why I was slightly disappointed in Silver Borne (#5) the first time around. Its plot and emotional impact were greatly enhanced by fresh familiarity with the events of the previous books. While Briggs’ refreshes the reader’s memory with little expository tidbits, the best reading experience means not depending on those tidbits for full context. I had forgotten some of the details and so I got to enjoy some of the twists and turns again, and some genuinely creepy moments. Vampires crawling up basement stairs, Mercy realizing a friend has turned into a zombie, monsters hiding in rivers. I’m just saying, could make for some great October reading. Wink wink. Anyway, ignore the terrible covers (there’s a reason the photo is of their spines), and check this series out. This summer, as I finished reading them, I lent them to my friend Cindy who had never read urban fantasy before and she lapped them right up. My sisters are fans too. Looking forward to number 7 which is out March 2013.